The global market for marine lubricants is experiencing a significant rise in its size and valuation, thanks to the increasing need to improve the output efficiency of machine parts and their output efficiency. With the increasing demand for group II and group III base oil, manufacturers are prompted to produce more base oil, which is reflecting greatly on this market. On the other hand, the inadequate supply of bright stock material has propelled the discovery of alternatives, which are likely to hamper the growth of this market in the near future. The shortage of supply is also expected to limit this market over the next few years. In 2015, the global marine lubricants market was worth US$2.32 bn. Expanding at a CAGR of 4.17% from 2016 to 2024, the market’s opportunity is projected to touch US$3.33 bn by the end of 2024. Among the regional markets for marine lubricants, Asia Pacific emerged as the market leader in 2015, with a share of more than 51%. Thanks to the vast requirement for marine lubricants in this region, the trend is expected to remain so over the next few years. The presence of a large pool of ports in Asia Pacific, primarily in China and the ASEAN countries is another important factor behind the growth of the Asia Pacific market for marine lubricants. Several economies, such as China, Japan, India, Singapore, Indonesia, Philippines, and Australia, are anticipated to contribute to the rising demand for marine lubricants significantly in this region over the forthcoming years. Europe is another prominent regional market for marine lubricants. The U.K., Russia, and Germany are the key contributors to this market, among which, the U.K. has acquired the leading position. The number of ships using inland waterways is higher in Europe than in other regions due to the presence of extensive inland waterways in countries, such as France, Germany, Belgium, Netherlands, as well as in Russia. This, as a result, is projected to boost the Europe market for marine lubricants in the years to come. Based on the type of product, the global market for marine lubricants is segmented into mineral oil, synthetic oil, and bio-based oil. The demand for mineral oil is much higher than the other two and the trend is anticipated to continue in the years to come. Synthetic oil is also gaining significant momentum across the world due to the cost benefits it offers and is expected to surface as the most attractive segment in the global market over the forthcoming years. In terms of the operation, the market is classified into inland and offshore. The offshore segment has been leading the overall market due to the widespread application of offshore waterways in transportation and ocean fish farming. The scenario is expected to remain so over the next few years, thanks to the increasing operations of naval fleets across the world. ExxonMobil Corp., Chevron Corp., Royal Dutch Shell Plc, Petroliam Nasional Berhad, BP Plc, Gulf Oil Marine Ltd., FUCHS, Idemitsu Kosan Co. Ltd., JXTG Nippon Oil & Energy Corp., QUEPET Lubricants, China Petrochemical Corp., Total Group, and LUKOIL Marine Lubricants DMCC are some of the prominent vendors of marine lubricants across the world. Lubricants play a vital role in the reduction of friction and wear and tear of operating parts of different machines. The movement of certain mechanical parts is operational only in the presence of lubricants. Marine lubricants minimize the wear and tear between different machine parts and improve their output efficiency. Marine lubricants have numerous uses in the shipping industry, as a result of which different types of engine oil, hydraulic oil, and grease are developed. Ships require marine lubricants for smooth functioning of machineries and components installed on them. Marine lubricants are effective in eliminating the harmful effects of friction. Introduction of the aviation transportation mode has hampered the water transport mode. However, owing to the high cost of aviation transportation, water transport has regained its popularity. Thus, the growing water transport worldwide is expected to fuel the demand for marine lubricants in the next few years. Group I base oils are getting scarce as well as expensive and witnessing fluctuations in demand. This is likely to result in shutdown of Group I refineries. The inadequate supply of bright stock material has propelled the discovery of alternatives, which also are inadequate. Thus, shortage of supply is expected to hamper the marine lubricants market in the near future. The report estimates and forecasts the marine lubricants market on the global and regional levels. The study provides forecast between 2016 and 2024 based on volume (kilo tons) and revenue (US$ Mn) with 2015 as the base year. The report comprises an exhaustive value chain analysis for each of the segments. It provides a comprehensive view of the market. Value chain analysis also offers detailed information about value addition at each stage. The study includes drivers and restraints for the marine lubricants market along with their impact on demand during the forecast period. The study also provides key market indicators affecting the growth of the market. The report analyzes opportunities in the marine lubricants market on the global and regional level. Drivers, restraints, and opportunities mentioned in the report are justified through quantitative and qualitative data. These have been verified through primary and secondary resources. Furthermore, the report analyzes substitute analysis of marine lubricants and global average price trend analysis. The report includes Porter’s Five Forces Model to determine the degree of competition in the marine lubricants market. The report comprises a qualitative write-up on market attractiveness analysis, wherein end-users and regions have been analyzed based on attractiveness for each region. Growth rate, market size, raw material availability, profit margin, impact strength, technology, competition, and other factors (such as environmental and legal) have been evaluated in order to derive the general attractiveness of the market. The report comprises price trend analysis for marine lubricants between 2016 and 2024. 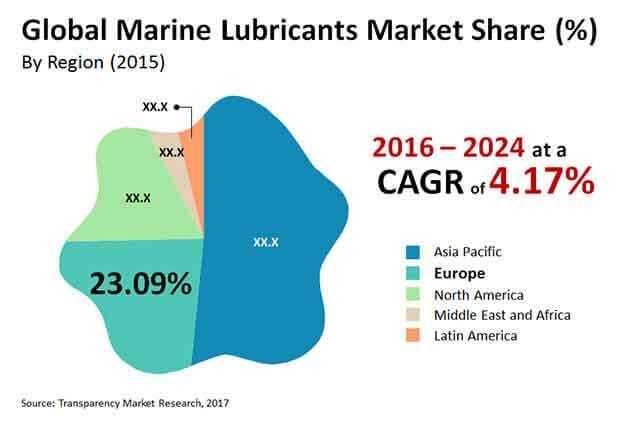 The study provides a comprehensive view of the marine lubricants market by dividing it into product, application, operation type, and geography segments. The products have been segmented into mineral oil, synthetic oil, and bio-based oil. The applications are segmented into engine oil, hydraulic oil, turbine oil, gear oil, heat transfer fluids (HTFs), compressor oil, grease and others. The operation types have been categorized as inland and offshore. These segments have been analyzed based on historic, present, and future trends. The product segment includes lubricants formulated from base oils such as mineral oil, synthetic oil, and bio-based oil. Out of these three types, mineral oil-based marine lubricants significantly dominate the market, followed by synthetic oil-based marine lubricants. Mineral oil falls under group I, II and III by API specification. Synthetic oil can be categorized as fully synthetic (group III, IV and V) and semi-synthetic – which is the mixture of synthetic and mineral oil. Bio-based lubricants are obtained from either vegetable oil or animal oil. The application segment includes engine oil, hydraulic oil, turbine oil, gear oil, heat transfer fluids (HTFs), compressor oil, grease and others. The most consumed marine lubricants are engine oil, gear oil, hydraulic oil and grease. Following engine oil, the second most consumed marine lubricant is hydraulic oil. Even though engine oil segment held significant share of the marine lubricants market, hydraulic oil segment is expected to exhibit major growth potential during the forecast period. Regional segmentation includes the current and forecast consumption of marine lubricants in North America, Latin America, Europe, Asia Pacific, and Middle East & Africa (MEA). Market segmentation includes demand for consumption in all the regions individually. The report covers detailed competitive outlook that includes market share and profiles of key players operating in the global market. Key players profiled in the report include Royal Dutch Shell plc, ExxonMobil Corporation, BP PLC., LUKOIL Marine Lubricants DMCC, Chevron Corporation, and Total Lubmarine. Company profiles include attributes such as company overview, number of employees, brand overview, key competitors, business overview, business strategies, recent/key developments, acquisitions, and financial overview (wherever applicable). Secondary research sources that were typically referred to include, but were not limited to, OPEC Annual Statistical Bulletin, U.S. Energy Information Administration (EIA), Marine Environment Protection Committee (MEPC), Independent Chemical Information Service (ICIS), International Chamber of Shipping (ICS), International Maritime Organization (IMO), company websites, financial reports, annual reports, investor presentations, broker reports, and SEC filings. Other sources such as internal and external proprietary databases, statistical databases and market reports, news articles, national government documents, and webcasts specific to companies operating in the market have also been referred for the report.